Essequibo begin a hectic GTM under-19 one-day Inter-County cricket campaign today against Demerara at the Police Sports Club ground, Eve Leary, with the first of back-to-back matches. After playing six days of cricket in a week in their first two matches in Essequibo, the Essequibians who traveled to the city today could be a tired lot when the action starts at 09:30 hrs. Having to travel to Berbice to battle tomorrow in their second game, the visitors could consider giving their leading fast bowler Ronsford Beaton, who bowled with genuine pace in Essequibo, a rest since his ankle injury is not fully healed. Navin Singh and Herrell Greene who have shared in two half-century opening stands in the three-day competition will hope for another good start while skipper Royston Alkins, Rovindra Parasram, Grayson Paul and Floyd Henry will need to score if Essequibo are to be successful today. After their loss to Berbice in their last match the ECB has replaced manager Prince Holder with Marvin Pearson for the city trip. 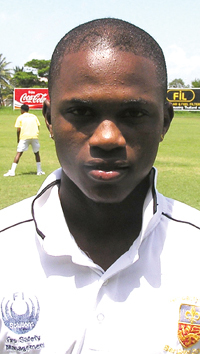 Former Guyana under-15 pacer Xavier McDonald travels as cover for Beaton and could share the new ball with Rovi Harris. Suresh Persaud has been sacked after leaving his team when he was left out of the last match and the youth could also face a ban from cricket in Essequibo. Alkins’ off-spin and the left-arm spin pair of Henry and Anthony Adams should provide support to the pacers for Essequibo. Led by new captain Rajendra Naikbarran, Demerara have made five changes from their three-day squad and could use a three-prong pace attack of Seon Daniels, Andre Stoll and Carl Rambarose on a pitch which could offer some early life. Under-19 spinner Totaram Bishun is the lone specialist selected, but batsmen Trevon Griffith, Delon Fernandes, Shameer Fazal, Arif Habib and Medha Dhanpaul could all bowl useful spin. The injured Jeetendra Sookdeo has been rested while Ricardo Devers, Ryan Rajmangal. Amir Khan and Vikash Dhaniram have been replaced in the one-day team. Today’s Umpires are Nigel Duguid and Ava Baker and admission is free. Demerara:- Rajendra Nikbarran (Capt), Quincy Ovid-Richardson, Trevon Griffith, Delon Fernandes. Shameer Fazal, Dexter Solomon, Arif Habib, Andre Stoll, Carl Rambarose, Seon Daniels, Totaram Bishun, Medha Dhanpaul, Devon Charles, Keshan Shivgobin.